These hand made earrings are perfect for every season - and with their multi colored theme, very versatile! 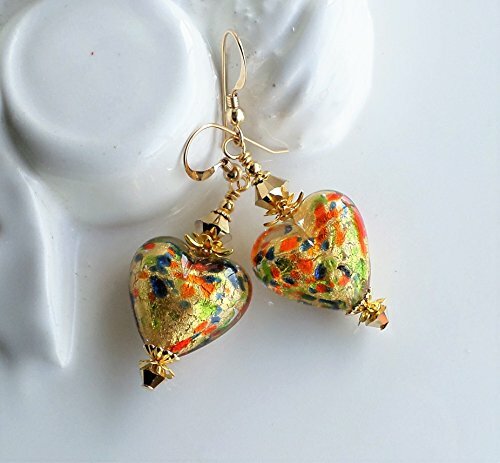 I have started with large genuine Murano glass heart shaped beads done with a core of genuine 24 KT gold foil, peppered with bits of Moretti glass in bright RED/ORANGE, BLUE and Green! The beads are encased in clear glass layers helping to protect the colors. ***Please note the bead size that is larger than some that I carry by viewing all pictures - the beads measure 3/4 inch long and wide each. Above and below I have added Swarovski Crystals in a fully coated metallic gold color called Aurum - I love this shade! The earrings hang a total length of 2 inches with 14 KT GOLD FILLED french ear wires.